Do-It-Yourself Holiday cards let you spread the Holiday spirit with a little personal flair. Print your own cards, fold your own envelope, and spread some hand-crafted Holiday cheer! The Holidays are a time to spread some cheer. Holiday Cards are a great way to reach out to loved ones, old friends, and people who have played an important part in your year. Take some time to let them know you’re thinking of them by printing out your very own Holiday Cards! It’s easy and convenient, and saves you a trip to the store! Nothing captures the Holiday spirit better than taking the time to make something by hand. 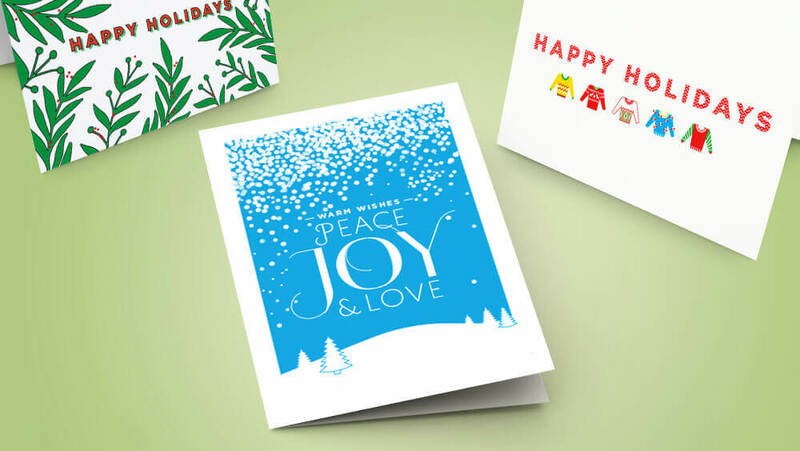 Our Do-It-Yourself Holiday Card templates let you choose between printing out one of our designs, or making your very own! You can even personalize each one to make it extra special for your family and friends. Look through our Holiday Card templates and choose which ones are right for you. Be sure to print them out on Hammermill Color Copy Digital Cover so they look and feel their best!